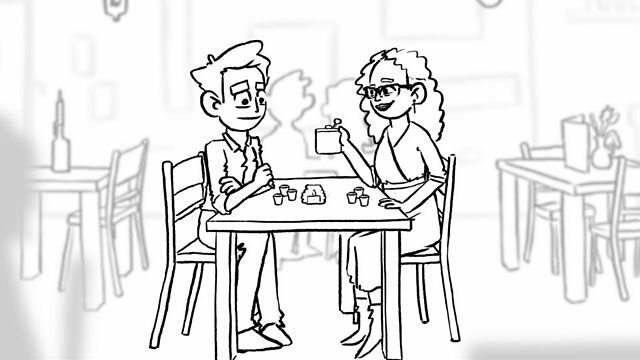 In this episode, Daniel is on a date with someone who likes to have a drink or two... or seven. What phrases does he use to move the conversation along? Watch the video to discover some key dating language. Yes, yes. Are you Daniel? I am Daniel indeed. Lovely to meet you. Oh going for the handshake. I love your dress. It’s beautiful. Yeah, when she first turned up, I thought she was very pretty. She seems really nice. I was excited for the date, you know. So, very nice to meet you. No, no. I actually work just round the corner, so when you suggested this restaurant, I thought well great that’s really handy for me. I come here all the time. Do you? So, are you nearby as well? I actually live in Oxford. It’s quite a good line though, isn’t it? Er, yeah, it’s a great line. You get the train from near here, don’t you? Yeah, just up the road. Cool, cool. I’ve never eaten here before. Oh drinks! Oh yes, now you’re talking my language. Yes! My apologies. Shall we just… couple of glasses of white? Yeah, I mean if we’re both having white, we might as well have a bottle? Er... Ooh… It started off well. The food was delicious. She was great company, but she did order quite a few drinks. The pad Thai is absolutely amazing. Oh yeah, but listen a good pad Thai you can’t beat it. They probably have some nice sides and starters and things. I haven’t ventured beyond that. No, I’m a very boring eater. Shall we see what they recommend? Because obviously the pad Thai might be quite heavy. So they might have some nice kind of like spicy bits from the sides. Cheers, nice to meet you. Yeah… Oop down the hatch! Ooh, really gets the back of your throat, doesn’t it. Absolutely. Yeah, yeah. Nice and warming. It’s pretty cold outside. Cheers. It’s going down a bit easy. Well, you’ve finished your first glass. I know, we might be getting another bottle quite soon. Oh, I’ve not even had a sip yet. Yeah, erm. So, thanks. If you just… do you want to leave the drinks menu on the table? Just because, yeah… we’ll be coming back for some more. Not really, no. By the end of the date, she’d brought out her hip flask, and… we were both quite drunk and it was pretty relentless to be honest. There’s a great place… like a block or so away. And it does a great happy hour. Yeah, so… they do the most amazing cocktails. And I think we’ll probably get there just in time for happy hour to get our order in. I thought we could have some coffee and straighten up a bit. No! That’ll sober us up! That’s cheating. It’s just a… Oh, look. It’s my hip flask. I don’t leave the house without it. And it’s always got whisky in it. There’re still shots on the table. We can have a nip on the way next door… a nip of whisky. You know what, I think I’m gonna go home. I don’t think so. No. She was lovely, but I don’t think I can keep up with her. So, are you nearby as well? We might as well have a bottle? I’ve not even had a sip yet. Melinda said this when Daniel suggests ordering drinks. Which of the these did Melinda say to express what she likes? Daniel said this so he could stop drinking. Which of the these did Daniel say to express what he wants. Daniel said this at the end of the date. Which of the these did Daniel say to express his decision? Join us in Session 23 for our latest series in our Experiment, 'Everybody's talking about...'.